In the atrium of UNT’s Business Leadership Building, home to the College of Business — which today is festive with green and white balloons and flower-topped tables adorned in emerald green — G. Brint Ryan (’88, ’88 M.S.) stands before family, university and UNT System administrators, faculty and staff, and donors. The West Texas native — who, after arriving at UNT from Big Spring in 1982 with little more than $300 and a 1979 tan Dodge Regal, went on to become founder, chairman and CEO of Dallas-based tax services firm and software provider Ryan, as well as chairman of the UNT System Board of Regents — also is surrounded by business students who, much like he once was, are eager to unlock their potential. He’s here to provide a $30 million key. “Fanfare, it’s time to go,” says UNT President Neal Smatresk, who stands parallel to a strategically concealed banner affixed to the atrium’s brick wall. As the UNT double brass quintet finishes playing, Smatresk relays what until now was unknown to most of those gathered. 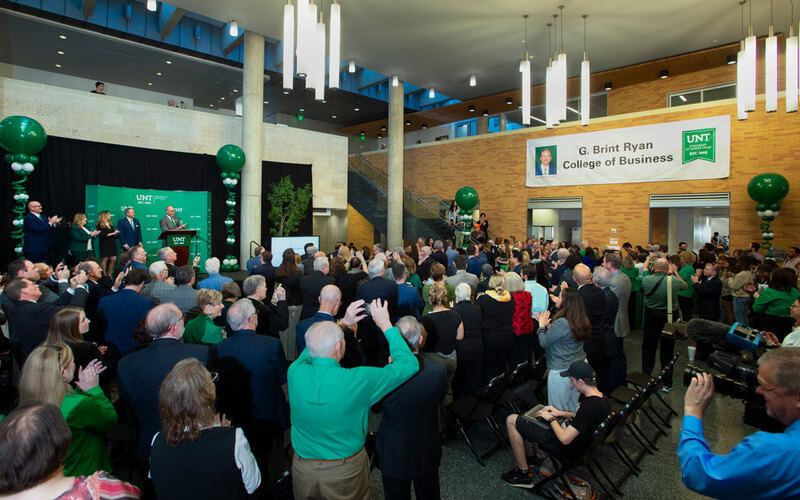 Amidst loud applause and a smattering of “wows,” the banner unfurls to drive home a second revelation: The College of Business, pending approval by the Board of Regents next week, will now be known as the G. Brint Ryan College of Business. The $30 million gift awarded by Ryan and his wife Amanda will create at least six endowed chairs and provide funding for academic program initiatives over seven years. Among the areas of focus are taxation and tax research, entrepreneurship, finance, logistics, information technology, cybersecurity and behavioral accounting. Amanda Ryan, who first met her husband in July 1993, says supporting the university and its students always has been a priority for the couple. She and Ryan, who married in 1996, have long been avid proponents of education, generously donating to various UNT programs throughout the years, while also bolstering organizations such as Helping Hands for Single Moms, which awards scholarships to parents in need. The gift will likely have far-reaching impacts, including inspiring other donors, says C. Dan Smith (’62), a marketing alumnus and former UNT System Regent. Lesa Roe, chancellor of the UNT System, works closely with Ryan in his role as chairman of the Board of Regents. 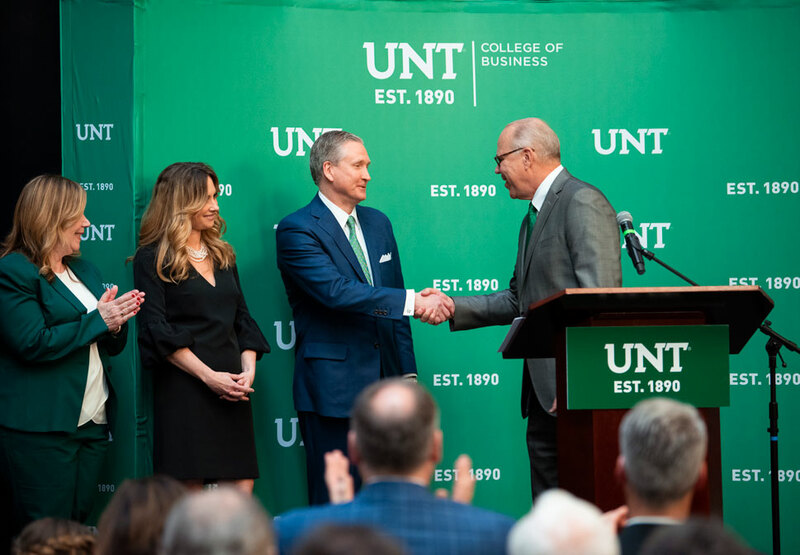 She’s seen firsthand his strength and vision as a leader and has never doubted his investment in ensuring that UNT’s business students learn from the absolute best in the industry. Provost Jennifer Cowley echoes Roe’s enthusiasm, and in the gift sees the potential for UNT to build upon its already nationally recognized programs. And members of the next generation can already picture the opportunities, too. Ryan Padilla, a senior marketing major who attended Monday’s announcement, says he was blown away by the gift’s potential impact. Graduate student Michael Babich who is working on his master’s in taxation, sees Ryan as an example of what is possible for students in the College of Business. Ryan can’t wait to see what College of Business students can accomplish with the extra resources and support his gift will supply. One of the reasons he loves UNT so much, he says, is that he feels a kinship with its gritty persona: a university filled with determined bootstrappers who consistently find a way to defy expectations. — Erin Cristales, University Relations, Communications and Marketing. Named to D CEO magazine's "Dallas 500"